During our latest property viewings, we were blown away by the new luxury villas that we now have available for 2018. 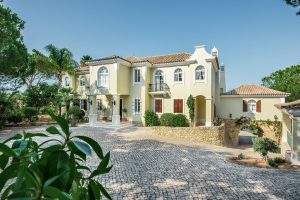 Whether you’re looking for a charming townhouse in the heart of Vilamoura or a grand luxury villa set in its own grounds, we can’t wait for you to experience these new properties. Our first visit to Casa Beatrice took our breath away! Set in its own peaceful grounds, Casa Beatrice is a grand, luxury villa located just a short drive away from the vibrant Vilamoura Marina. With 6,000 sq. metres of landscaped gardens for you to enjoy, this stunning property is ideal for large families or groups looking to enjoy quality time together in beautiful surroundings. Your adventure starts the minute you walk through the imposing iron gates, as you step in to a lovely courtyard dotted with trees and traditional stone steps. The picturesque entrance sets the scene for this grand Portuguese estate with Casa Beatrice at its heart. The house features five stunning bedrooms all luxuriously decorated and with spectacular views of the grounds. The spacious lounge enjoys high ceilings, archways, pillars and a gallery above leading to the bedrooms. There’s even a music room for the budding pianist in you! Moving outside you’ll be spoilt for choice with the different al fresco dining spots and comfortable seating areas. There’s also a stunning swimming pool, tennis court, large fishpond, olive and palm trees located in the enclosed gardens. Comfortable sun loungers and tennis equipment are provided for guests and there’s even a dance studio just minutes away from the villa. If you’re looking for a more relaxed, laid back property then Casa Carlota is perfect. This charming two-bedroom townhouse is located in the popular town of Vilamoura, in the attractive Vilamouraténis Village and is ideal for a family break. 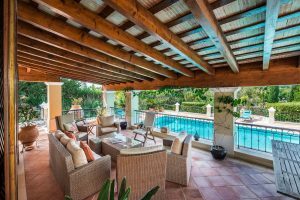 Situated in the heart of the tennis village, with attractive views of the lush landscaped gardens and adult and children’s pools, Casa Carlota is an excellent holiday retreat for families. 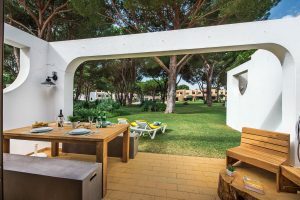 The reception areas are beautifully designed and furnished, providing direct access to the large village gardens and communal areas. During your stay you can take part in outdoor activities including tennis and paddle facilities or simply just relax by the pool. The surrounding areas are also wonderful for a relaxing stroll or you can wander down to Vilamoura’s vibrant marina where you will find a fantastic selection of restaurants, bars and shops. Last but certainly not least is Villa Florence an incredibly luxurious 5 bedroom villa, located in a completely secluded and elevated position on the Pinheiros Altos development. 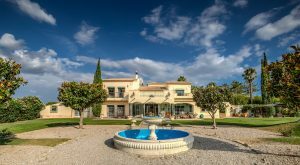 Around a 30 minute walk to Quinta Shopping, restaurants and bars, Villa Florence enjoys stunning golf course views. Distinctively unique, the villa is approached via a bridge and a sweeping calçada driveway which spreads under the Roman type tunnel leading to the imposing entrance façade. A grand driveway and entrance lead to the most fabulous gardens with spectacular views to enjoy in every direction. 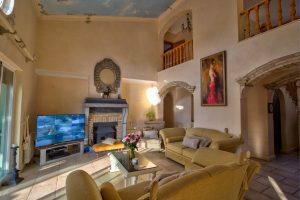 As you enter the villa you immediately feel the luxury that this property offers throughout. There’s a wonderful feeling of space and light as you leave the hallway and enter the open plan living room, complete with two seating areas and a separate dining space. There are five stunning bedrooms all complete with en-suite bathrooms and the master suite features a large terrace enjoying beautiful views of the garden and swimming pool. Outside, the large swimming pool is surrounded by immaculately manicured gardens and sun loungers for up to 10 people. There are several dining and seating areas to choose from with a superbly sized garden for hours of fun playing games with the family. 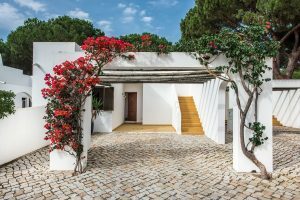 Having undergone a recent renovation, the finish in Villa Florence is second to none, providing a very stylish and comfortable setting for your holiday on The Algarve. At The Real Algarve we understand our clients and how to provide you with the ultimate luxury holiday experience and this all starts with finding you the right property. We spend time and energy getting to know you so that your holiday really is perfect. If you’d like to find out more about the new additions to our exclusive portfolio, call our Reservations Team on 0161 980 3555 or email info@therealalgarve.com. Don’t forget to keep up to date with our all our latest news and exclusive offers by following us on Facebook and Instagram.